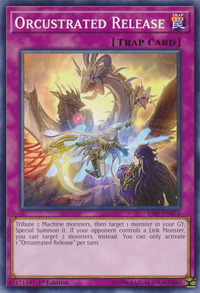 Tribute 2 Machine monsters, then target 1 monster in your GY; Special Summon it. If your opponent controls a Link Monster, you can target to 2 monsters, instead. You can only activate 1 "Orcustrated Release" per turn. Guardragon Pisty, Guardragon Agarpain, Guardragon Elpy, Galatea, the Orcust Automaton, Longirsu, the Orcust Orchestrator, and (possibly) Knightmare Corruptor Iblee appear in this card's artwork.